Protect and preserve the longevity of your car seats while adding a stylish flair in just minutes. Our high quality fabric is super soft to the touch and backed by 3mm of breathable foam padding to disperse heat and keep you comfortable and cool, even in the hottest temperatures. Sustains your automobile interior upholstery. Concealed Velcro opening and adjustable straps helps installation, removal and reattachment Compatible with removable headrests only. Special stitching technique enables side airbag compatibility – officially tested! 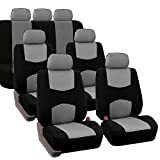 Durable stretchy fabric with opening pocket for storage Engineered to accommodate traditional and heated seats Rear seat covers allows all types of split to enable partial seat and backrest fold down or move Semi-customized to fit most vehicles. Material is breathable. Machine wash and air dry. This full set includes seat and headrest covers for two (2) bucket seats and one (2) rear split bench. Material are made of Flath Cloth. Machine Washable. Air dry. Item includes: – 4 front bucket covers – 1 rear bench seat cover – 1 rear backrest cover – 7 headrest covers – 1 bag of S hooks . Buying tips: – You might want to consider a different set if your vehicle has high back seats with non-detachable headrests in the front because this set comes with separate headrests. – Please also note this set is not equipped with front side airbags and rear split function.